By structuring the content on the site in a search engine friendly manner, China-Briefing.com is now able to reach high results for the most relevant of terms, with quick indexing by Google of their news content. China-Briefing.com is a valuable online source of China business news, and MooMu Media helped them capitalise on their high quality and growing content to gain incoming links to their site, including links from education and Government websites. MooMu Media optimised the site’s structure for both the regular Google Search Results and Google News, allowing multiple entries on the same page for some search terms. In 2010, China-Briefing.com underwent a dramatic redesign, and with the help of MooMu Media, all the SEO value of their site was maintained. Following both a redesign and a strong offsite campaign by MooMu Media, China-Briefing now ranks high on Page 1 of the international Google results, for the terms ‘China business news’ and ‘Chinese business news’ alongside publishers like the Hong Kong Standard and the China Daily. Since commencement in late 2008, searches for business related terms are four times higher, while total non-branded search traffic (all traffic excluding the name of the publication) has increased over 500%. 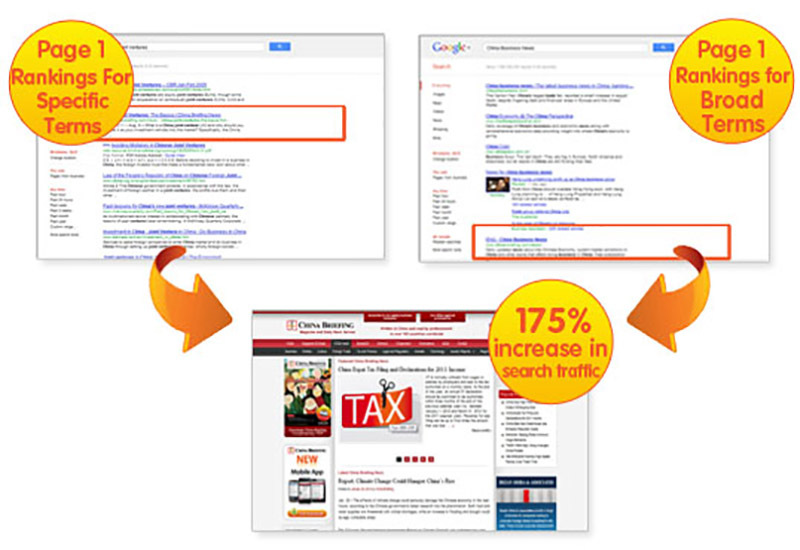 Increases are ongoing, with non-branded search traffic increasing 90% In 2011.